It’s sure to win favor among hawks of both parties, while distracting the media and public from his domestic woes—but foreign powers are not backing down. Upon entering the White House, Donald Trump’s governing blueprint was clear: to force through conservative priorities on domestic issues—immigration, health care, tax reform, environmental regulation, and so forth—while avoiding major crises abroad. Although Trump had made no secret of his admiration for the US military during the campaign, he insisted that achieving progress (as he saw it) on domestic issues took precedence over confronting Russia over Ukraine, or China over the South China Sea. But now, with his domestic program a shambles and the White House under investigation by federal prosecutors, it appears that Trump and his allies are shifting the pendulum in the opposite direction, away from an exclusive focus on domestic issues and toward a more bellicose stance abroad. Such a shift is sure to win favor among Congressional hawks of both parties, while distracting the media and the public from Trump’s domestic woes. It also entails enormous risk, as Russia, China, Iran, and North Korea are also flexing their military muscles—making any confrontation in Europe or Asia the possible spark for a major conflict. The administration’s aggressive new stance has been brewing for some time, but became blatantly evident on August 8, when President Trump blurted out his apocalyptic warning to Kim Jong-un of North Korea, saying his regime had best cease its nuclear and missile threats against the United State or “they will be met with fire and fury like the world has never seen.” Although Trump left unsaid what he meant by those remarks, he clearly envisioned military action on a very large scale, possibly including the use of nuclear weapons. The Trump administration is turning up the heat on North Korea as well as Russia, China, and Iran. No doubt discussion of North Korea and possible US military “options” will dominate the airwaves in the coming days and weeks. But it is important to recognize that the Trump administration is also turning up the heat in its relations with other potential adversaries, including Russia, China, and Iran. Regarding Russia, this increased belligerency was most evident during Vice President Mike Pence’s recent visit to Estonia, Montenegro, and the Republic of Georgia. 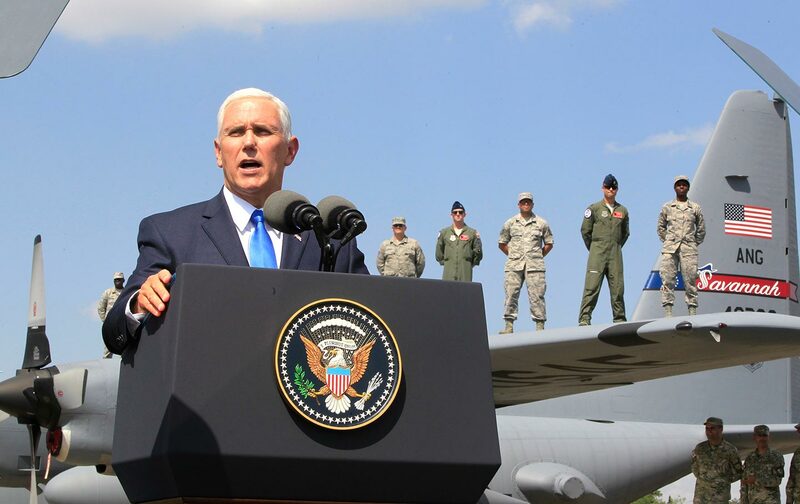 Although not well covered by the US media, Pence’s trip to these three small states on Russia’s periphery marked a turning point in the administration’s stance on Russia, NATO, and the role of military force. Whereas Trump had dismissed NATO as “obsolete” during the campaign and expressed doubts as to whether the United States would defend Estonia and the other Baltic states in the event of attack by Russia, Pence denounced Russia in unusually harsh terms and endorsed efforts undertaken by the Obama administration to bolster NATO defenses in the region. Vice President Pence endorsed Georgia’s efforts to join NATO—a move bound to infuriate Moscow. Pence expanded on this combative stance the following day, while on his visit to Georgia—a former Soviet republic that fought a brief war with Russia in 2008, when the Georgians attempted to reassert control over the breakaway enclave of South Ossetia and Russian forces intervened on the Ossetians’ behalf. Not only did Pence pledge strong support for Georgia’s efforts to regain control over the enclave, but he endorsed its efforts to join NATO—a move bound to infuriate Moscow. Pence continued in this vein during his visit to Montenegro, a former constituent of Yugoslavia that just joined NATO in the face of fierce opposition from Russia. “We truly believe the future of the Western Balkans is in the West,” he declared, using language strongly reminiscent of the Cold War era. Although President Trump had earlier expressed hopes of improving ties with Russia and China, he has clearly ordained a more militant stance toward these countries and other perceived adversaries. While in Poland on July 6, for example, he lauded NATO and urged Moscow “to cease its destabilizing activities in Ukraine and elsewhere.” Although he opposed the new Russia sanctions bill (which also penalizes Iran and North Korea) on constitutional grounds, saying it infringed on the president’s authority to make foreign policy, he signed it anyway, and used the occasion to warn Moscow against adventurism in Europe. “We will side with our allies and friends against Russian subversion and destabilization,” he declared. Trump has also signaled a more assertive stance toward China. During the campaign, he regularly denounced China for defrauding America through its trade and currency practices, but once in office he adopted a softer stance, saying the Chinese could compel North Korea to abandon its drive to acquire nuclear weapons and long-range missiles. But with Beijing demonstrating little inclination to do this—not that surprising, given China’s reliance on the North as a buffer against the large US military presence in the South—Trump appears to be reverting to his earlier posture, viewing China as an economic and geopolitical adversary rather than as a potential collaborator. On June 29, he approved the sale of $1.4 billion worth of advanced weapons to Taiwan, a move that triggered an immediate protest from Beijing, which views the island as a renegade province. Trump is also thought to be planning steep tariffs on imports of steel, much of which originates in China—another step that is bound to provoke anger in Beijing and could result in Chinese retaliation, possibly leading to a disruptive trade war. On Iran, Trump’s increasingly belligerent stance is even more evident. When visiting Saudi Arabia in May, he endorsed the Saudi leadership’s drive to combat Iranian influence in the greater Gulf region—including, by extension, its brutal and indiscriminate air campaign against the Houthis in Yemen, said by UN officials to involve war crimes. More ominously, he has ordered his security aides to find ways to claim that Iran is in violation of the nuclear deal forged by the Obama administration, under which Tehran pledged to abandon its nuclear enrichment program in return for relief from economic sanctions. On July 17, Trump reluctantly informed Congress that the Iranians were in compliance with the 2015 nuclear accord—a step he must take every 90 days under the legislation governing sanctions relief—but reportedly instructed his staff to produce evidence of Tehran’s noncompliance before another three months are up, thereby giving him an excuse to withdraw from the agreement. If Trump pulls out of the Iran nuclear accord, Tehran could resume its nuclear program, increasing tensions in the Persian Gulf. 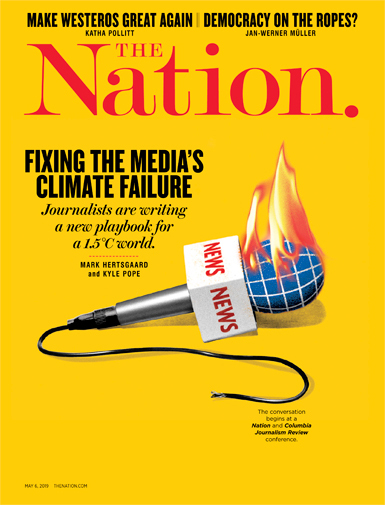 An American withdrawal from the nuclear accord would have enormous diplomatic repercussions, given that the accord’s other signatories—Britain, China, France, Germany, Russia, and the European Union—are unlikely to join Washington in repudiating it but instead are bound to condemn Washington for its disruptive behavior. Even more worrisome, Iranian hard-liners might insist that Tehran was now free to resume its nuclear program, increasing tensions in the Gulf area and setting the stage for a military confrontation of one sort or another. American and Iranian warships often jostle each other in narrow Gulf waterways, and it would not take much for such an incident to explode into something much more ferocious. Donald Trump’s embrace of a more bellicose foreign policy is worrisome enough. But it must be set against a global environment in which other actors, including Russia, China, Iran, and North Korea, are also adopting a more belligerent stance, increasing the risk of violent encounters. The Russian shift is especially alarming. From all accounts, President Putin hoped that Trump’s election would lead to an improvement in US-Russian relations, and possibly the relaxation of economic sanctions. Indeed, many American analysts believe that Putin (or his associates) intervened in the 2016 election with this outcome in mind. Whether or not this was the case, the fallout from investigations into Russian meddling in the election—combined with deep-seated Russophobia among foreign-policy elites in Washington—has resulted in an even more hostile environment than was the case before the election. Apparently concluding that amity with Washington is now impossible, Putin has chosen to assume a more antagonistic stance. That tough new posture became evident on July 30, when he ordered the American diplomatic mission in Russia to reduce its staff by 755 employees, a draconian move reminiscent of Cold War days. (Putin reportedly had hoped to avoid such action, even after, in December, President Obama ordered the expulsion of 35 diplomats from the Russian embassy in Washington, but moved swiftly after Congress approved those new sanctions on Russia.) After issuing this order, moreover, Putin inspected a mighty procession of Russian warships in waters off Saint Petersburg, lauding the navy’s revitalization after its post–Cold War decline; similar processions were conducted at Russian naval bases in Sevastopol in Crimea, which Russia seized from Ukraine in 2014, and at Tartous in Syria, where the Russian are expanding their military presence. Russia has been preparing for Zapad 2017, its largest military exercise since the collapse of the Soviet Union, with as many as 100,000 soldiers, sailors, and airmen expected to participate. While all this has been happening, Russia has been preparing for Zapad 2017, its largest military exercise since the collapse of the Soviet Union. As many as 100,000 soldiers, sailors, and airmen are expected to participate in the exercise, which will take place in areas of Belarus, western Russia, and the Baltic Sea in mid-September. Major portions of Zapad—which means “west” in Russian—will take place in areas close to Ukraine and the Baltic states, creating anxiety in these countries and their NATO allies; some analysts worry, for example, that some Russian forces will remain in Belarus after the exercise, possibly setting the stage for another round of assaults by Russian-backed rebels in Ukraine or for probes against the Baltic states. President Trump and Vice President Pence reportedly discussed these concerns when meeting with their counterparts in Poland and Estonia, respectively, and NATO officials have been discussing the deployment of additional troops and missile batteries in the Baltics as possible countermeasures. What will happen in September is anyone’s guess, but expect all sides to be on high alert for incidents and transgressions. China has also been exhibiting a more muscular stance in recent weeks. On the same day that Putin was reviewing Russian naval forces in Saint Petersburg, Chinese President Xi Jinping was conducting a similar review of Chinese armed forces at a huge military parade in Inner Mongolia, commemorating the 90th anniversary of the formation of the People’s Liberation Army. As described by Chris Buckley of The New York Times, President Xi, wearing military attire himself, “watched as 12,000 troops marched and tanks, long-range missile launchers, jet fighters, and other new weapons drove or flew past in impeccable arrays.” As in Saint Petersburg, the massive display of force in Inner Mongolia was intended to demonstrate the growing power of the Chinese military and, one assumes, the preparedness of senior leaders to employ force in the pursuit of vital national interests. All this is especially significant, as Xi seeks to cement his status as China’s most consequential leader since Deng Xiaoping, who opened up China to the global economy. With China’s economic growth now slowing, Xi appears determined to project himself as the prime architect of China’s global rise, and that means being prepared to stand up to the United States when confronted by provocative behavior in areas the Chinese consider vital, such as the East and South China Seas and Taiwan. The Chinese are also worried about a possible war in the Korean Peninsula, and so have been beefing up their military presence in that area as well. Any conflict arising between the United States and its principal foreign adversaries—even if circumscribed at the outset—is likely to prove far more deadly and dangerous than the current US battle with ISIS, Al Qaeda, and the Taliban. China, Russia, and North Korea possess nuclear weapons, and all three, along with Iran, maintain large conventional forces equipped with modern weapons of all types. An armed encounter with any of them could escalate quickly into full-scale combat, with heavy casualties on all sides and a significant risk to any civilians trapped in the battle zones. How should progressives respond to this danger? First, of course, we must call on our members of Congress to put pressure on Trump and his senior aides to avoid military action over North Korea and pursue a negotiated solution, as advocated by Secretary Tillerson and others. Besides that, however, it is essential that the progressive community recognize that opposition to Trump’s foreign and military policies is as vital as opposition to his domestic policies. If Trump does move us into a warlike environment, opposition to his domestic policies could be swamped by the inevitable rally-round-the-flag impulse, and those who persist in such efforts will be branded as traitors. This is by no means an obscure scenario to imagine: Just listen again to Trump’s inauguration speech, with its call for a new American patriotism. Our task, then, is to watch Trump’s military initiatives very closely, and be prepared to challenge every step he takes that brings us closer to the inferno of war.